Parents may have questions regarding what charger and cable meets our School's 1:1 iPad 6th Generation specifications. The information below is meant to help you get the right replacement cable and charging power adapter, if necessary. The proper charging block for the 6th Generation iPad is a 12W USB Power adapter. We recommend the original Apple 12W USB Power Adapter. 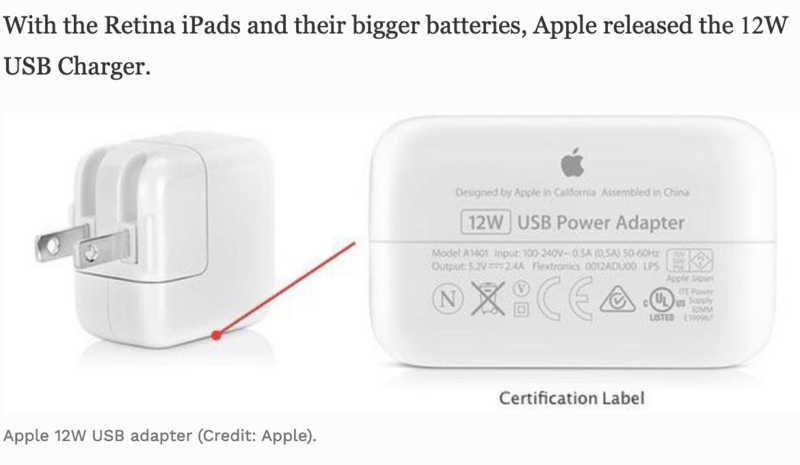 Apple puts the chargers under rigorous testing for safety and reliability and are designed to meet the government safety standards. Here is a link to purchase the Apple 12W Power Adapter. For more information about charging your iPad, refer to the Safety, Handling, and Support section of the iPad user guide. However, you can also charge the iPad with “Made for iPad” or other third-party cables and power adapters that are compliant with USB 2.0 or later and with applicable country regulations and international and regional safety standards, including the International Standard for Safety Information Technology Equipment (IEC 60950-1). Other adapters may not meet applicable safety standards, and charging with such adapters could pose a risk of death or injury. If you decide to purchase an off-brand model ensure it meets the specifications to avoid any risk of injury or damage. The compatible charging cable for the 6th Generation iPad is a USB lightning cable. Our recommendation is to purchase a genuine Apple USB lightning cable. Here is the link to purchase the Apple USB Lightning cable. If you are considering purchasing a off-brand cable, please ensure that it is Apple MFi certified. Non-certified cables can be very dangerous to your device. These cables often can get extremely hot and cause damage or destroy your device. Here is the link to check if you cable or accessory is MFi certified accessories.